From 8 p.m. to 6 a.m. each night/morning from April 21 through Wednesday, April 24, crews will close Edwards Access Road to install a water main. Crews will also close the road during the same hours Thursday, April 25 into Friday, April 26 to install bridge girders at the Eagle River Bridge. Businesses and residences will remain accessible, but motorists must use Miller Ranch Road and US Highway 6 as alternate routes. Night work is possible for the foreseeable future. As part of this ongoing work, the traffic signal at US 6 and Edwards Access Road may temporarily be set to "flashing" mode during nighttime construction hours only. During this time, construction flaggers will direct traffic through the intersection. CDOT and Eagle County are making improvements to Edwards Spur Road, an approximate 0.6-mile-long stretch that connects I-70 to US 6 in the unicorporated town of Edwards. 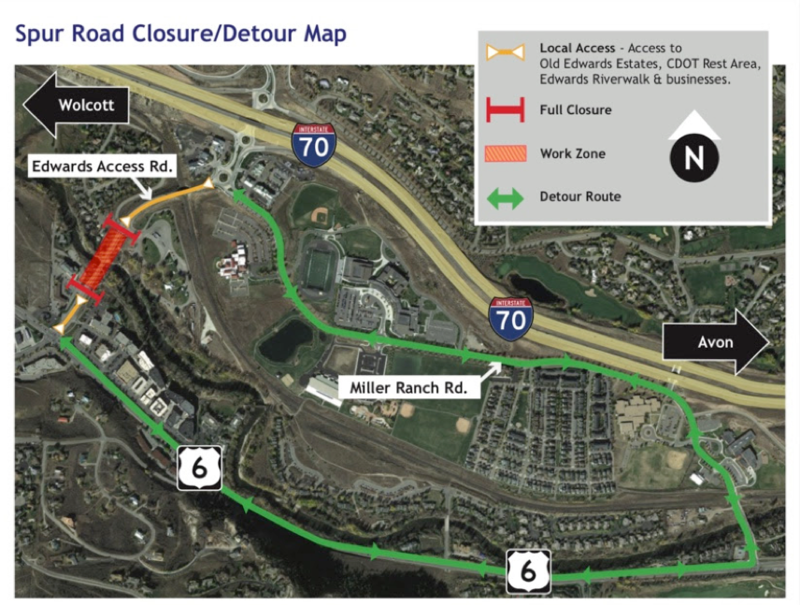 This improvement impacts two major thoroughfares—I-70, Eagle County's primary transportation corridor, and US 6, which carries large amounts of traffic that runs parallel to I-70 from Dotsero to Dowd Canyon. 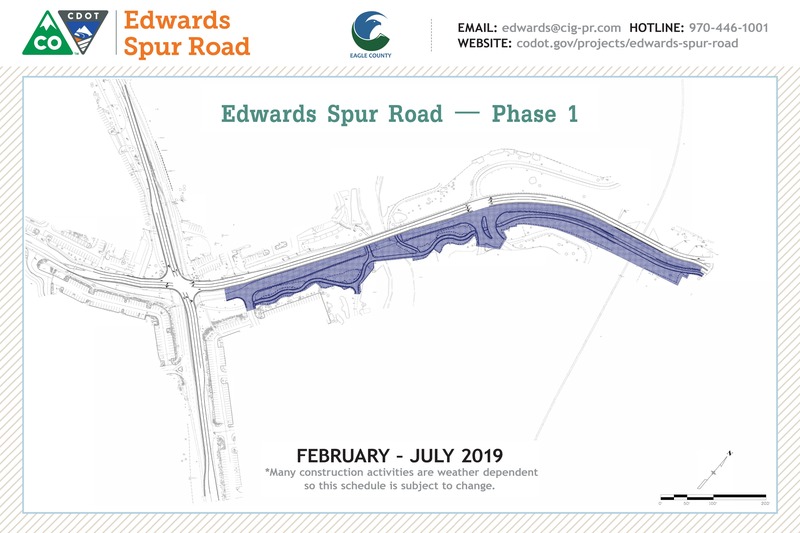 Phase 2 of the project will include designing improvements for the southern half of the Edwards Spur Road, starting north of the roadway bridge over the Union Pacific Railroad (where Phase 1 ended) and ending with the connection to US 6 to the south—a distance of approximately 0.4 miles. Crews will widen roads and bridges, and improve intersections and pedestrian mobility. Single-lane closures with alternating traffic, intermittent traffic stops, and flagging operations along Spur Road are possible. Major construction to convert the intersection with US 6 into a roundabout will begin in June. Crews will remove 28,000 cubic yards of soil from the hillside between Edwards Corner and the Edwards Commercial Park. This soil will be used as fill for the roundabout at Edwards Spur Road, after which time the property will be regraded. That parcel of land has no development plan. Look for signs alerting motorists to haul trucks traveling between the sites (estimated to be about three per hour). Eagle County will monitor for issues related to the excavation or haul traffic. The property owner must revegetate all disturbed areas after soil removal is complete. Spur Road traffic has been shifted to the west side of the roadway so widening work can begin on the east side. There is still one lane of travel in each direction with narrowed lanes. The area highlighted in blue is where construction will take place over the next several months for road widening. This also shows the necessary single lane in each direction along the western half of the Edwards Access Road/Spur Road. Edwards Spur Road CDOT Presentation Jan. 17, 2019 from Eagle County Government on Vimeo. To see more project background information, please visit the Eagle County website.